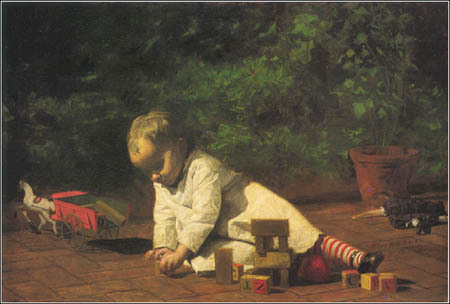 Thomas Eakins. "The Baby At Play"
The other day, my mother mentioned the first thing I ever said. It was a question: "Whossat?" This was, of course, the closest I could get to "Who's that?" According to all the stories, I said it every single time I saw someone enter the room, pass the window or drive by in the street. This went on for quite some time. It occurred to me that my first "word" pretty summed up what I would be all about for the rest of my life. It foretold who I was going to be: someone who is preoccupied with figuring out who the people around me are, really -- what makes them do the things they do and feel the things they feel; what moves them; what scares them; what deludes them; what drives them to walk, act, think and dream in certain particular ways. In short, my first "word" was a question I try to answer every day of my life in my writing, my private thoughts and even in my music. How much do our first words reveal about us all? What is the reason our little brains choose to break out with a particular one? Did my parents' constant encouragement of my curiosity cause this to be the first thing I ever said or did something hard-wired into my brain make me say this? (I'll avoid the tired, unanswerable "nature versus nurture" thing, now.) Either way, my first verbal smoke signal to the world was what it was. E. Zampighi. "Grapes for Baby"
It was a pebble dropped into the pond of my awareness, for sure. What was your first word? If you don't know, find out -- find it out and interpret it -- figure out what it reveals about who you are today. At the very least, you will become more philosophically aware of the seed of the linguistic tree that has grown to such elaborate size in your mind. And that's pretty cool. I'd love to hear from you on this one: First thing you said and what you think it says about you. No one can get this wrong, and just wrestling with the question might well get us all closer to figuring out what makes the Rolex of all animals -- the human animal -- tick. I'm not sure what my exact first word was, but I think the fact that I said "sacre" over and over again while holding myself up to the coffee table and drawing circles (say-kerr) with a pencil says something about myself. Haven't been able to stop drawing since. Yeah -- even if that wasn't your firt word, it has to be significant . . .